A Master Maker is a person who is committed to focusing on supporting the learning of others and enriching the positive culture of the makerspace. They look out for the safety of others and foster confidence among their peers. 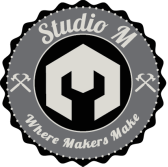 Every student will be a Master Maker at least once (for a duration of one week) before completing the Studio M course. The Master Maker has a special tool belt and/or apron, that is stocked with project tools and supplies. This helps them move around the studio space, to help others with ease.